Scott argued extensively about the real reasons carriers are trying to move you to tiered data plans from unlimited, and concluded that it doesn't have much to do with the network congestion arguments, but rather stock value maximization. As if to prove the value of tiered data for carriers, WSJ ran a Captain Obvious type of an article that had numerous new iPad owners complaining how quickly they are chewing through their 4G data plans with it. 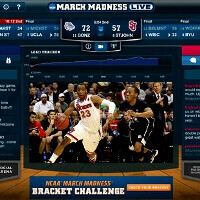 The comparatively large high-res display of the new iPad is certainly enticing to watch March Madness games, but, as Brandon Wells quickly found out, streaming NCAA basketball live on your dashboard ate his $30 plan in two hours. Another example was given with the 24-year-old Albert Park from Austin, who switched to his new iPad's 4G connection to stream some YouTube videos in a coffee shop whose free Wi-Fi connection was congested, and burned through 2/3 of his monthly allotment in an hour or so. Now they are considering buying additional gigabytes for the month at $10 a pop, and upgrading to the $50 for 5GB plan, which both AT&T and Verizon will no doubt appreciate. The other option on the table might not be to their liking, though - when slammed with overages, people might start considering a cut-down on their video streaming habits. An hour of high-def video via 4G blows through 2GB of your monthly plan, Verizon calculates, and people will undoubtedly stop using as much on their new iPads when they get the bill. Until the first quarterly results after the iPad's launch are in, though, analysts can start upping their carrier stock price targets, as there will be many more subscribers that buy extra gigabytes after enjoying streaming video on the new iPad's pretty display in the next few weeks. Did you already hit the data cap after getting the new iPad?